Uni Kiel | What do marine snails and insulin have in common? What do marine snails and insulin have in common? The cone snails are predators of the sea. They capture fish by injecting a venom into the prey that consists of a cocktail of different substances. The single components of the snails’ venom, so-called conopeptides, are known for their extraordinary pharmacological properties and potential. One example is Ziconotid (Prialt), a conopeptide that is prescribed as a pain medicine. That makes it one of the first medicines to contain substances from marine organisms. 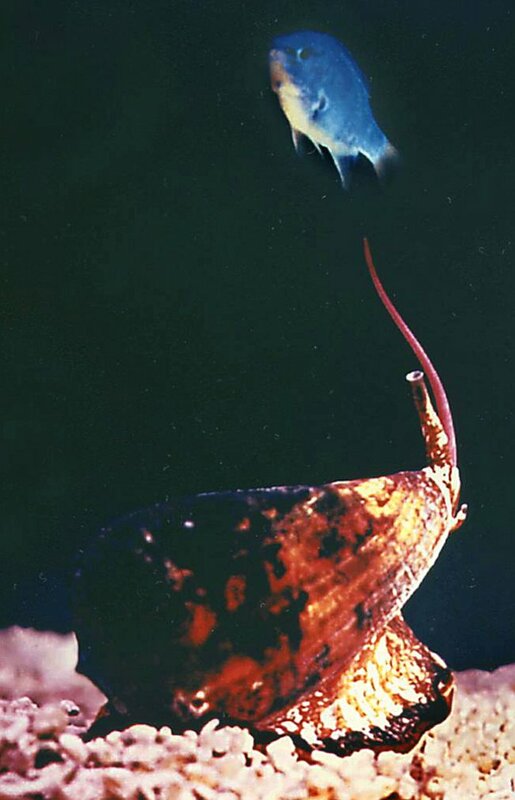 In collaboration with scientists from Canada and the USA, research teams at the Universities of Kiel, Lübeck, and Göttingen have examined the venom of the cone snail Conus striatus. They were able to prove that a certain peptide (Conkunitzin-S1) alters the release of insulin in the pancreas cells. Their findings were recently published in the scientific magazine EMBO Molecular Medicine. “This potentially could be a new approach to the treatment of type 2 diabetes”, says Professor Heinrich Terlau from the Physiological Institute of Kiel University and associate member of the Excellence Cluster “Future Ocean”. “The action of some substances that are ordinarily used in the treatment of type 2 diabetes is independent of the blood glucose level”, Terlau describes. This can lead to low blood glucose, also known as hypoglycaemia. “What is new about this substance is that it has a very specific effect. Because of this fact, the likelyhood of side effects such as hypoglycaemia is minimal”, Terlau continues. Glucose is part of our nutrition. When it enters the digestive system, the pancreas cells release insulin. The sugar is then chemically broken down in the blood. In patients with type 2 diabetes this mechanism is disturbed; they suffer from an excessive sugar level or hyperglycaemia. The newly discovered substance, conopeptide Conkunitzin-S1, binds to a specific potassium channel in the pancreas cells and leads to a temporaryly increased release of insulin but only if the blood sugar level is raised. Following oral glucose tolerance tests on rats, the scientists found that Conkunitzin-S1 does not lead to hypoglycaemia. In other words, the typical side effects of some conventional type 2 diabetes medications do not occur. “We are working on a way to administer the peptide orally,” Terlau says. Finol-Urdaneta, R.K., Remedi, M.S., Raasch, W., Becker, S., Clark, R.B., Strüver, N., Pavlov, E., Nichols, C.G., French, R.J., and Terlau, H.: Block of Kv1.7 currents increases glucose-stimulated insulin secretion. Caption: A cone snail goes hunting: With its long proboscis and a harpoon-like tooth it injects a venom into a fish, which is then paralysed. Picture taken from: H. Terlau et al., Nature 381: 148 (1996).